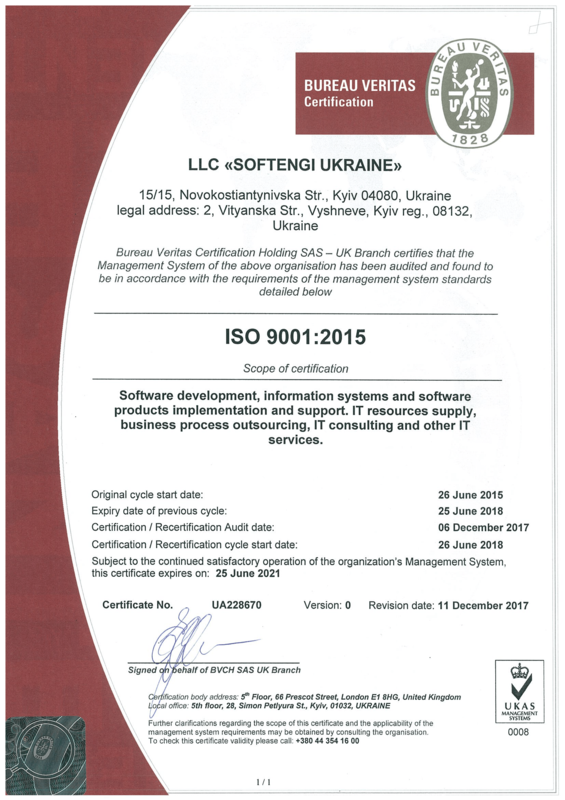 Softengi, a global software development company, announced that, having fulfilled the Quality Management System requirements, it has once again affirmed its conformity to ISO 9001. The company performs audits, surveillances and validation, as well as certification of management systems. The services comprise the following areas: quality, environmental, and safety management systems for all kinds of branches and companies or organizations. Softengi is a global SOFTware ENGIneering services provider, whose goal is not only to develop code and meet technical requirements, but also to become part of the client’s team, bringing its expertise and valuable contributions to the project. With over 200 professionals located in Ukraine, the USA, and Western Europe, Softengi applies individual approach to create top-notch software solutions for your business. Included in The 2015 Global Outsourcing 100 list compiled by The Association with Collaboration at Its Core (IAOP), Softengi is officially recognized for its excellence in global performance.